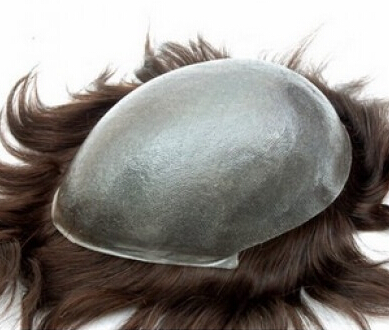 Today, we are introducing another men's stock toupee model: HS1 super thin skin base men's stock toupee. Have a look at the pictures below before we explain its features. 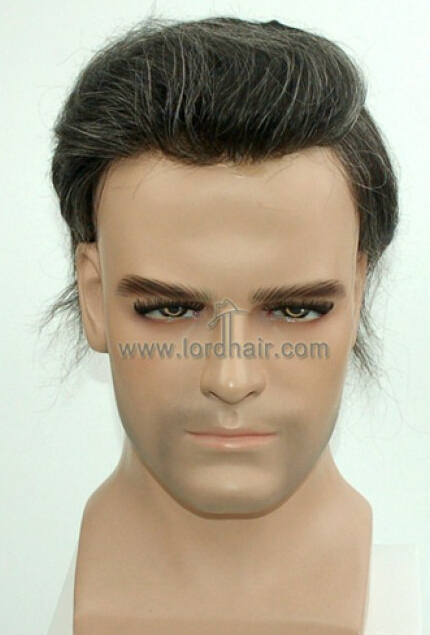 This men's stock toupee is super thin skin all over, with v-looped hair on the front 1/4" to create a very natural hair line, and the remainder with single split knots which is fine and more durable. The hair density of this men's stock toupee is med-light, which suits most customers. The hair length is 5-6", which is enough to be cut into most men's hairstyles. The hair type is 100% human hair, soft Indian hair with natural body wave. You can have it permed with any wave or curl after you recieve it. We also have some grey hair colors, like #1B10 (base color is #1B with 10% grey hair mixed), #1B20 (base color is #1B and with 20% grey hair mixed). The grey hair is in 100% Kanekalon, which is the highest quality synthetic hair, it looks natural and will not fade after long use. The base size for this men's stock toupee is 8" x10", which can be cut into any smaller size easily. We can cut the base size into your requested size before shipment if you need.